The Birmingham Medical Institute (BMI) was founded in 1875 as a membership organization to provide a meeting place and medical library for the medical profession in Birmingham and the surrounding area. Its location moved from various sites in the city to 36, Harborne Road in 1957. Here it was joined by the West Midlands Regional office of the BMA and Local Medical Committee. 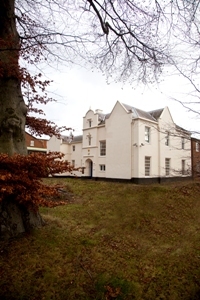 It was initially a Library, then a Social Club but in 2009 became the BMI Conference Centre. Much of the activity was based upon the requirements of outside organisations for meetings, conferences and catering. From January 2016 the BMI relocated to the Birmingham Chamber of Commerce. It follows, that instead of administering a building hired for the conduct of meetings etc, the activity will be solely the organisation of meetings. Coincident with this move is the change in medical postgraduate education based upon Health Education, England. There will therefore be an even greater need for the smaller medical organisations to be brought together, a role that the BMI is well placed to fulfil. In order to accomplish its mission its future activity will be concentrated upon Primary care and Public Health because secondary care education is now largely organised nationally by the Royal Colleges and Specialty Societies. The BMI also has a commitment to provide activities for its members.